Steep and deep above the Summer Road, Mt Olympus. A proud groomer-free zone, skiing at Mt Olympus is all about embracing what Mother Nature gives us, and making the most of it. When it's on, it's REALLY on. 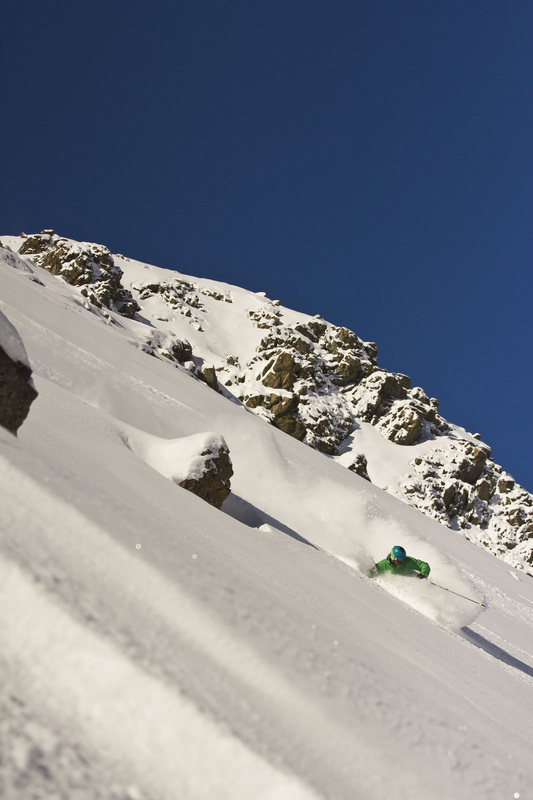 A foot or more of dry, champagne powder (which can be a rarity in New Zealand) is not uncommon after a storm and the relatively modest skier numbers mean there are fresh tracks to be had well after the event. Later in the season, Mt Olympus offers some of the best spring corn around and the basin's excellent snow-keeping qualities mean that we can be skiing well into October most years. Fancy skiing fresh lines all day? What would be a joke in a commercial ski area is very much reality at Mt Olympus, due to the modest skier numbers on the mountain at any one time. 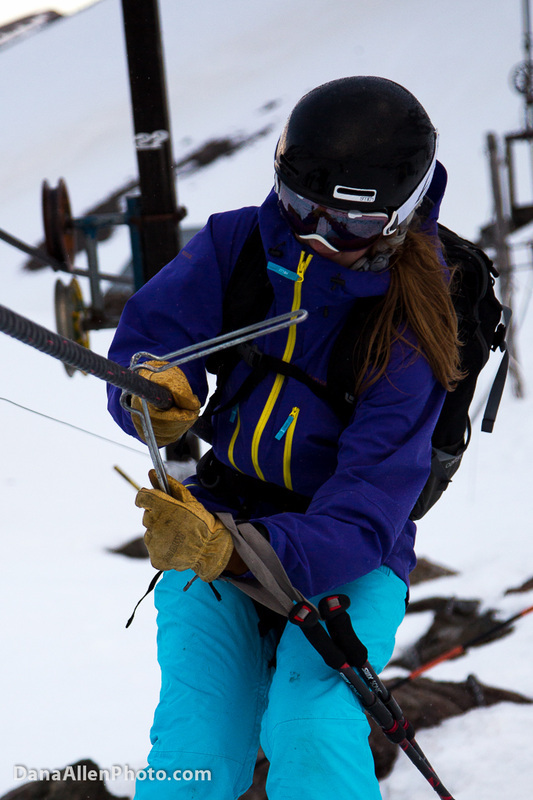 A combination of an access road that requires the right vehicle and skills to negotiate it, and the four 'nutcracker' rope tows that service the field, do a good job of keeping skier numbers manageable. One hundred people would constitute a very big day here and it's usually way less - compare that to some other mountains you might have skied before discovering Mt Olympus. Around here, the only reason people wait at the bottom of the lift is to give their legs a rest from the last run or yarn with a friendly soul as there's no rush - plenty of snow and mountain for everyone, all day. Riding them is pretty straightforward thanks to a metal device called a 'nutcracker' (pictured left) which is attached to a tow belt or harness. The nutcracker grips the rope, rides through the pulleys that keep the rope up and comfortably tows you up the mountain. Note the Learners Tow is usable as a hand-held also so beginners can travel without the tow belt and progress up to it as they advance. Dedicated parents can easily tow their younger children behind them until they are tall enough, or strong enough to master it themselves. Nutcracker towbelts are available for daily use free of charge from the container at the base of the Access Tow, while harnesses are available for purchase from the Canteen in the Top Hut or by emailing towbelts@gmail.com for advance purchase. A word to snowboarders: due to the tows operating on both heel-side and toe-side, riding the lifts can be a challenge and we recommend that only snowboarders who are physically fit and can ride at an advanced intermediate level or above attempt to ride the tows. For the keen backcountry skier, Mt Olympus has some incredible hiking and touring options available a short distance from the top of the lifts. Popular short hikes include Ardi's Peak, Little Alaska, the Back Ridge and the Sphinx. Longer hikes and ski tours can be undertaken to the summit of Mt Olympus and over into the 403-hectare Ryton Valley, which can offer over 1000m of leg-burning vertical in a good snow year. For those keen on longer trips, it is possible to tour the Craigieburn Range to other club ski areas like Mt Cheesemen, Broken River and Craigieburn Valley. Whenever you're thinking of hiking or touring, Mt Olympus asks that you follow best practice for safe backcountry travel. This means asking advice, informing people of your intentions, respecting all closures, travelling with a minimum of three in your party and always taking your transceiver, shovel, and probe.